A cooling tower is a heat exchanger, inside of which heat is withdrawn from the water by contact between the water and the air. The heat transfer occurs through the heat exchange between air and water and through the evaporation of a small part of the water that needs to be cooled. This will allow to cool down to a temperature lower than the ambient temperature, which is an important advantage compared to dry coolers. Consequently, a cooling tower is not a chimney producing smoke. The mist which can be seen above a cooling tower is regular steam with the same composition as a normal cloud. Cooling towers can be divided into types in different ways: based on the fan type, shape, water flow or efficiency, cooling water composition... The main classification tends to be based on the cooling circuit type, which determines the exact operation of the cooling tower. 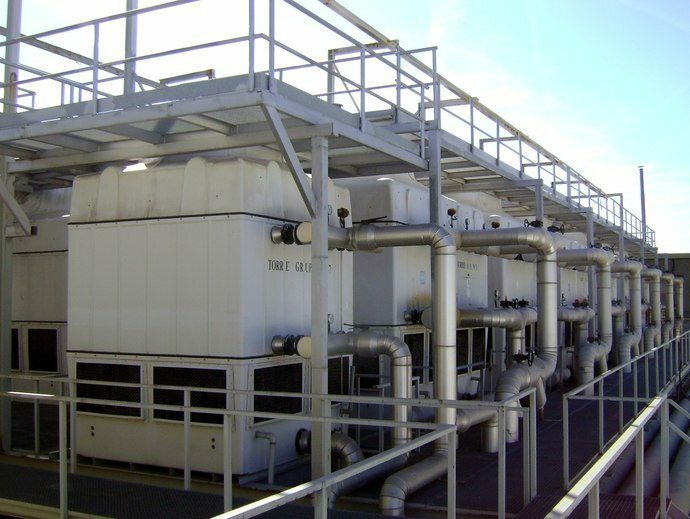 The cooling circuit type determines the exact heat exchange process.